The build quality and water quality are great, and flow rate is a bit slow but adequate. However, after we shut off the system, a lot of water drains, it flows about 20 seconds, until the water level drains down in the visible cartridge holder (so I assume in the other two) down to the level of the outlet, so. I assume this is some small adjustment that needs to be made but couldn't find a troubleshooting guide or how to fix online. Great system and I'll give 5 stars across the board if we can get it to waste only a little water. Thank you for your review. We are very glad to hear the system and water quality are great! To clarify a few points you mentioned: 1. The flow rate is designed to be apx. 1/2 Gallon/minute, which is purposely made this way to ensure it's not flowing through too quickly and thus filtering more thoroughly. If it's taking more than 15 seconds to fill an 8oz glass, please call us and we'll help resolve it, otherwise, it's intended to be this way. 2. The slight dripping you mention for about 20 seconds is normal function of countertop filter systems as they have to depressurize after the water is turned off, this is not a defect or something that needs to be fixed. To avoid wasting even this little drips of water, we recommend to turn off the system a little sooner, say when your cup is about 2/3 full and let it continue filling. Also, you can purchase a little rubber cap from a third party (e.g. amazon.com) and cover the spout opening after each use if you'd like. The things I like most about these products includes reliability, quality construction, ease of use and installation, and -most importantly- that they provide an excellent way for me to obtain clean drinking water without worrying about consuming contaminated tap water. I use to buy bottled water, use to, until a friend of mine gave me a drink of water. It was chilled and I immediately felt truly refreshed. My body wanted more. After drinking a few more glasses, I knew I just had to buy my own. 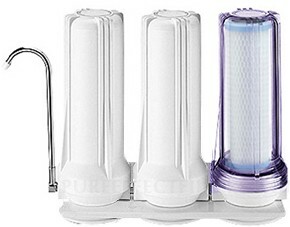 The system is responsibly priced compared to other filtration systems. However, it was how I felt that was the real factor as to why I bought one. The Best system Out There!